I used boxes to create a "Broadway Show" billboard look. To simulate lights I used big yellow labels and inside the boxes I pasted prints from artists I would use in my lessons during the year. I called it: "Watch for Upcoming Events." 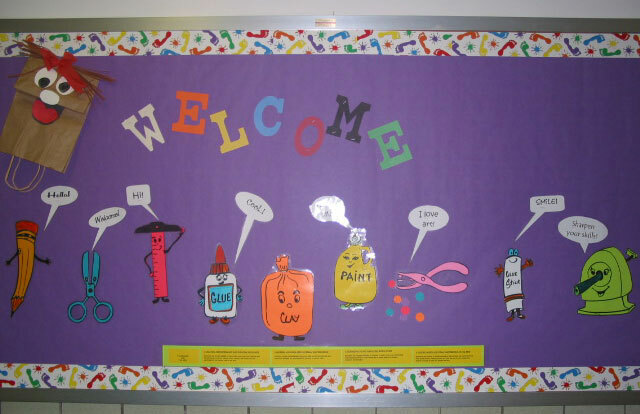 Norma created a welcome board with cartoon art supplies. 2. A large calendar for due dates. 4. I create a board area for each of our strands here in TEXAS. One board used the modern art posters set, then I used Shorewood prints for various art styles on the other boards. 4) Response/Evaluation ( I put one piece of work per week or two - we talk about that work and students have some questions they have to answer from observing the artwork) This is at the front of the room. We have "Meet the Teacher Night" before the kids come to school. So I've been decorating my bulletin boards with samples of work that kids will be doing that year. A few years ago my kids were making these marvelous paintings during the last week of school. I asked the kids if any of them would be willing to leave their paintings at school over the summer so I could display them for the start of school. This idea appeals to elementary students, and the hallways are filled with their wonderful paintings from day 1. Added by Ken Schwab: I teach high school and I have a lot of examples from past years from students that I put up to show some of the projects we will be doing. I also include some of my personal examples to show the art 1's that I too can do the work. At the front of the room I show examples and preliminary studies for the first projects they will be doing in all my classes. One year I did Themes in Art. I used my Take 5 art prints and added to them. I had Horses, People at Play, People at Work, Urban, Math Connections and others (total of 8 bulletin boards). I added a portrait/bio page for each artist. I remember doing one for Summer fun - How did you spend your summer vacation? I used various prints of children/people at play. Words for the Pillars of Character Education. Large 18" (45.7 cm) letters and quotes to go along with the word. I also did a READ board and used the posters my Art Club students made with book quotes. I have a portrait of a girl reading that I displayed with that. I used art prints that were interdisciplinary. I did a couple social studies boards, math and science, Exploratory (included prints for PE, Music, Home Ec., Tech.). Do you know this artist? I used well known works of art and added clues. My students got bonus points for turning in the names to me. My students drew a huge picture of one of Van Gogh's self-portraits (One where he is smoking a pipe ) and put it on my door, colored it in Van Gogh style with oil pastels. Next they put a Santa hat on him (It was December) Then they spelled out "Van Gogh's top ten Christmas wishes". They then had to look up information on him so that the wishes matched his biography. Students came up with some of the following: An ear muff that fits me, a good therapist, to sell more artwork, a roommate I won't fight with... They added these to the door. We came back one day to find our door decoration down and a note that Van Gogh was on out of school detention for a tobacco violation. The note said if they wanted Van Gogh back they had to find the answers to the following questions regarding tobacco and alcohol use. They had to turn the answers into the counselor. (You come up with the questions - get with the guidance counselor to play along). We looked up the answers on the Internet and got him back. I though it was a cute way to teach both art and healthy choices. The kids are really fascinated by this board and it get tons of activity. Student created - using Art Quotes from Randy M.
I printed out 20 quotes by artists (number of quotes needed depends on number of students you have). On day two of this year I am greeting them at the door with the quote and they are going online (outside of class) and finding an art example by the artist and printing it, attaching it to the quote and hanging them on their bulletin board. We will be using the net a lot in this class so I thought it would be an icebreaker. Note: You might want them to find a self portrait or photograph too to add. Laminate these then you will have them for future years. You could even do this as "service learning" or career lesson. Designing the poster to share with the lower grade levels. Tie in a career lesson in graphic design using Publisher to create the posters (or what ever software you have). Students could also write a short biography to display with the quotes posters. Trees - "Fall into Art" from Carol K.
Note: Trees could stay up to display fall themed art and other seasonal art projects. Here is some interesting info I pulled off of Enchanted Learning. I am going to blow it up and use it on my bulletin board along with my color wheel. Note - be sure to check Enchanted Learning for the correct symbols for many of the letters. I like to do a "careers in art" bulletin board with many, many different jobs posted. The Careers in Art Posters are very nice. Set of 12 - 18" x 24" (45.7 x 61 cm) - provides students with an overview of many different careers in the visual arts. Several Getty members have posted over the years that they have the students make careers posters and put them up in their room. I have a huge bulletin board in my room. Many years ago, I bought wide grey tweed suit fabric for about $.99/yard at a fabric store and covered all the bulletin boards in my classroom. It is still there, and still looks great, whether there is art work up or not. If I want color, I put a colored Construction Paper behind each piece of art, or splash colored shapes randomly over the board before posting the art work. The board is wonderful for critiquing, as students can pin their work to the board, and we all sit back and discuss. It is also great for posting information about artists or things that relate to the lesson we are doing. I enjoy having this bulletin board, even though sometimes it seems a chore to keep up. Having it covered with Fabric has saved me lots of time. World map with pins, mark the map with art styles, artists, and works as you move throughout the year. Local art events and lessons offered by individuals and businesses outside of school hours. I found an old poster I had made that said, "No Heart, No Art" That has become my opening theme. I cut out hearts of different sizes and scattered them all over my bulletin boards and around the room. Some of them have quotes on them such as "Learning is not a spectator sport." On my large board with the hearts I have various posters about art. During a printmaking unit for all grade levels, I had the Kindergarteners make the borders for the display. I gave each child a strip of 6"x18" (15.25 x 45.7 cm) paper and we made a row of hand-prints on them. That in and of itself wasn't too creative, but I think the way we printed was. I had the students paint directly on their hands to make the print. They were encouraged to mix colors, but I did not give them any color mixing instruction. Image their delight and surprise as they created all kinds of "new" colors like "chocolate milk, watermelon, and slime," (their names). They especially liked being able to paint on themselves. The borders looked great! Suggestions compiled by Michal Austin from Getty TeacherArtExchange posts. Put up bulletin boards with the finished work of everyone in the class (if possible), and a brief explanation of what the project was all about. List the name of the class, as well as teacher’s name. If students sign the front of their work name tags are not necessary, otherwise, add student name labels. Putting everyone's artwork up (not just the "good ones") allows kids to see that there are many different solutions to the 'problem'. So for example if the lesson is on line quality, it would say, "Investigation using LINE". Have each of advanced student put their portfolios in the showcase. It is the student’s responsibility to show their work to the best of their ability. Students may add interesting objects to enhance their showcase. Hang various op art posters & reproductions and post the saying "What do you see". Put up three to four reproductions and have students try to find out the similarity. Sometimes the similarity is the exaggerated use of complementary colors, sometimes it's that all artists are American or female. Hang as many reproductions of portraits that you can find. Students describe in great detail the portrait they are looking at. Then they swap their descriptions and try to identify the correct one. For a "Happy New Years" bulletin board display a list of artists and probable resolutions they would make regarding their art work with prints next to their names. Students may suggest resolutions for the painters, for example, need to use more texture. Display interactive bulletin displays where people who pass by and are interested can take a lesson (or materials) from a display envelope and do the same lesson like those examples on the bulletin board. For example... "eye" designs with a packet of dittoed eyes and cover sheets so teachers/students could do the same lesson. Another example: shading with popcorn, include a little popcorn in a box next to the display... explain that this isn't edible popcorn... and include little Mat board pieces to glue the popcorn on. Make little popcorn still-lifes plus paper to draw it on. Another display: put up a solid light-color Construction Paper on the bulletin board in the library with instructions on "what is non-objective art?" with boxes of Crayons nearby. In class start the design and put it up unfinished with instructions for anyone passing by to add to the design (but it had to be non-objective). Being in the library under the eagle eye of the librarian proves to be an asset so no one uses the coloring opportunity inappropriately. Create an assignment for the class to make a visual puzzle using a rebus (where the picture replaces the word). Start with Matisse and color theory. One section is devoted to Matisse and the other for mixing primary colors. Since Harry Potter books are so popular a drawing of a Harry with a wand and the title "The Magic of Color". How about art history? Take a famous painting and have one of the kids photograph the others in their group in the same pose and costume. Have several groups doing different poses. Then post the photographs on the bulletin board and the passer-bys have to guess the artist and title, year, etc. Change the theme by asking, "What art movement do these paintings have in common?" At the beginning of the year show everyone what they missed last year! Put up photos, examples, lesson sheets and pix of the kids with their artwork. Have one board that deals with Vocabulary, Value scales, Color Wheels and some of the tools of the trade. Keep an "information only" board in the room, making it easier for the students to locate important information. The bulletin, the school newspaper, local newspaper articles, Color Wheels , rules and expectations of the class, and bell schedules all go on this board. Put up a big piece of white paper and put out markers and let everybody who visits the art room on open house do a doodle or drawing. 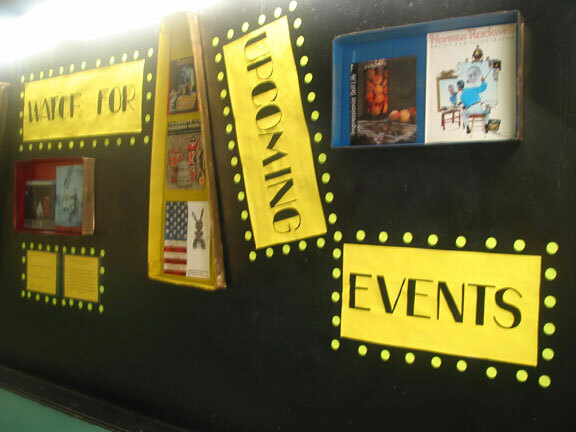 Plan a display that centers around the artists the tables are named after. Give the students a serious shot of art history right off the bat. Have them design things for the room to reinforce those artists. Build a lot of displays that try to explain the concepts or the process behind the work. Include books, photos, tools, etc., along with the art. Build a display around this quote about crayons: "We could learn a lot from Crayons ; some are sharp, some are pretty, some are dull, some have weird names. All are different colors, but they all have to learn to live in the same box." Have a WOW wall (Wall of Words). (Archive) Use them to promote your program and make sure they look as if they were done by an artists. Buy postcards with actual artists photos (or find photos on line) and have their artwork laminated along with the postcard. Add a quote, pose a question, or possibly a few hints on who the artists is/what he/she does depending on the artwork, or go into critical thinking questions about he artwork. Art Student of the Week: included would be a photo of the artist with their artwork/s and anything else they'd add... maybe artist quotes, what inspires them, etc. Post optical illusions on the side door where kids from other classes pass by. Sometimes wrapping paper can lend itself to interesting backgrounds. If you’re lucky enough you can find wrapping paper that has architectural designs. Use it as the background for famous and interesting buildings in your area and from around the world. Iridescent cellophane makes a neat effect. Create a display on color where some of the vocabulary words have Velcro on the back, to make it an interactive bulletin board. Kids have to place the color words in the correct places. For naming the tables after artists, cover a small reproduction with clear contact paper (may want to laminate it first for added protection) and adhere to table. You may hang the reproductions over the tables as well. Try to use some 3D type materials sometimes, like thick yarn for vines for a Rousseau display. For Open House do an Art Scavenger Hunt. The parents and kids will check out certain displays around the school to answer the questions for the game... and be sure to include a prize! Add different career, etc. throughout the year as they are "discovered/explored". ART: Keys to a Brighter Future - Big keys with art elements/principals of design -- big master lock -- opening a rainbow of possibilities for a future in art (careers even the most science-math bent administrator would not want to live without). Animation - Game and software design - video/cinematography - Computer graphics... on and on. For a theme "Keys to success in Art" put up class expectations next to skeleton keys. The word ART will be on a master lock with a key opening it up with a rainbow of colors coming out. Put up bulletin boards that get people to think about the world... our purposes... kind of theme based... reasons for art. Use the Take 5 art prints to show how artists communicate similar themes in different ways. Have an art timeline created by students. Also have maps cut out in the shapes of different places studied. The maps have color copies of artworks hanging from them with information about that area and the artwork produced there. The maps can be made by students. Paint one of the walls bright grass green, very modeled, lots of roller marks. Spray paint mat borders and/or frames gold and hang them randomly all over the wall. Paint a new mascot, Pigasso, with wings on the wall acting like he is hanging stars (glow in the dark of course, have to use a black light, kids love it!) all over the wall and ceiling. Quote "Reach for the Stars!" will go up, too. Do a word wall using primary and secondary colored Crayons . Make a copy of a crayon box out of Construction Paper , complete with folded lid, and write "Art Words" on the front of the box. Fill the box with Construction Paper Crayons , and then make individual crayons with upper and lower case alphabet and tape them at different angles on the wall, so the children's words will go underneath the appropriate first letter. Create a wall that looks like the side of a brick building. Make a larger than life paintbrush, crayon and pencil from large cardboard tubes. These objects are "mounted in the brick wall" and using the matching art media, write three different quotes about art by famous people. As the children complete their art assignment in class, they are given a red Construction Paper "brick" (Approx. 6" by 12" / 15.25 x 30.5 cm) and write something about art, using Permanent Markers or Oil Pastels . Most write their own feelings about art, such as "art rules!!! ", or "I'm smart, I love art!" As the sentiments are added, the children are encouraged to come up with more original and creative ideas. I did a "Happy New Years" bulletin board for the main lobby... with a list of artists... and probable resolutions they would make regarding their art work with prints next to their names... also, had an area for students to suggest resolutions for the painters... for example, need to use more texture, etc... even parents added to the write on list.. and there were no inappropriate remarks. When we did shading with popcorn, I had little popcorn in a box next to the display... explaining this wasn't edible popcorn... and little Mat board pieces they could glue the popcorn to (which was basically how our display work was done) and make little popcorn still-lifes plus paper to draw it on. I found that some of the teachers enjoyed doing the projects themselves. Another display was putting up a solid light-color construction paper on the bulletin board in the library with instructions on "what is non-objective art?" with boxes of Crayons nearby. In class we started the design and it was put up unfinished with instructions for anyone passing by to add to the design (but it had to be non-objective). Being in the library under the eagle eye of the librarian proved to be an asset so no one used the coloring opportunity inappropriately. It was gorgeous when finished and was done by a lot of the student body and faculty.